DAVIE, Fla. — Walk in the front door of the Miami Dolphins’ headquarters, and the new vibe is impossible to miss. The lobby has been remodeled and now features less memorabilia, putting the focus on the important stuff: the franchise’s two Lombardi Trophies. Out on the practice field, the head coach who looks young enough to be a player is unafraid to jaw at defenders between plays. When Adam Gase was hired in January to lead the Dolphins, the message he wanted to deliver was one of starting over. Don’t dwell on the ups and downs of the past few years, including a turbulent 2015 that bore a midseason coach firing, a 6-10 record and a last-place finish in the AFC East. “Who are we going to become?” Gase instead asked. That’s a team-wide question, and one directed at Ryan Tannehill. Though he hates the moniker, Gase was largely hired for his reputation as a quarterback whisperer, which he earned by effectively working with quarterbacks of all talent levels, from Peyton Manning to Jay Cutler to Tim Tebow. Tannehill is a fifth-year passer who has already thrown for more than 15,000 yards but has never been part of a winning NFL team. 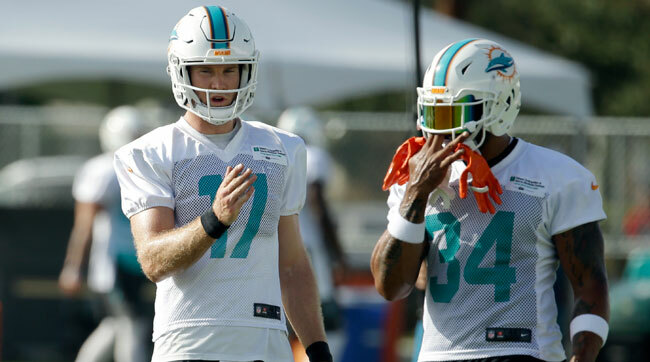 Ryan Tannehill (17) discusses a play with Arian Foster. In his office last Friday evening, Gase brought up the 15,000 passing yards stat, noting that only two other quarterbacks have ever passed for more yards than Tannehill in their first four years in the league: Peyton Manning and Dan Marino. It’s just one example of how Gase is throwing his support behind the 28-year-old QB. Their relationship is still a new one. Gase waited until he saw Tannehill throw in person this spring before diving into a film review. Now, the offense is in the “throw a handful of spaghetti against the wall and see what sticks” phase, as Tannehill puts it. Gase is trying to learn everything about his new quarterback as fast as he can, but he’s realistic: The scripted reps on the practice field serve a purpose, but they don’t go a long way toward revealing how Tannehill will respond in the flow of a game against a foreign defense. It’s more than just on the field. Gase is letting Tannehill run some of the offensive meetings—taking players through film of one-on-one drills, for example, or going through the plan for the afternoon walk-through. “We try to put him in a position where the other players can hear him talk about what we are doing. That opens up the lines of communication,” Gase says. It takes a lack of ego for a coach to turn over a meeting room, but that’s what Gase did in Denver with Peyton Manning. When Tannehill leads these meetings, instructing his receivers on the way he wants specific routes run, some of those tips have come directly from Manning’s mouth. The newly retired quarterback visited South Florida as recently as last week, and Tannehill doesn’t hesitate to share what they talked about. “Route concepts,” he says. Tannehill is focusing on the small picture. He’s trying to get “faster in my feet,” for example, because Gase has told him that will allow him to get the ball out faster. In one recent practice throw, this lesson was reinforced: Tannehill was a little slow at the top of his drop, and a little late with a throw to Jarvis Landry. The receiver still caught it, but missed out on yards after the catch that would have been there had the ball arrived sooner. But beyond the small picture is a big picture that can’t be ignored. The four-year contract extension Tannehill signed last offseason set this up to be a prove-it year, with his base salary nearly doubling in 2017 to about $18 million, most of which is not fully guaranteed until next spring. He pauses, and apologizes for going on a tangent. It’s really just another show of support for his quarterback. Back to the original question though: How much does Tannehill need to show in one year under Gase for the Dolphins to proceed forward with him? 2) The weakest spot on the Dolphins’ roster is their secondary. Case in point: they are counting on second-round pick Xavien Howard, a rookie who still hasn’t practiced in camp because of a knee injury, to be a Week 1 starter opposite Byron Maxwell. With Howard still sidelined, it didn’t go well on Friday for some of the options behind him. Tony Lippett got his ankles broken (figuratively) by Landry, and Chimdi Chekwa left with a leg injury. The Dolphins weren’t the only team (see: Carolina) to turn to the draft’s deep and diverse cornerback class to fortify the cornerback position, and they have high expectations for Howard once he’s healthy. But there’s little margin for error. 3) On the flip side, the Dolphins have a wealth of depth on their defensive front. Even with Ndamukong Suh sitting out with a minor back injury last Friday, the defensive line still dominated the practice. 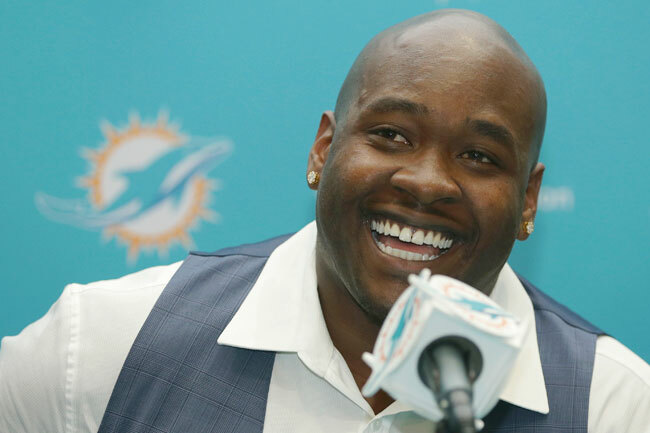 Against the first-team offensive line, DE Andre Branch beat Laremy Tunsil and Terrence Fede beat Ja’Wuan James for would-be sacks of Ryan Tannehill. They have more defensive linemen than they can fit on their roster, and some—Chris McCain, perhaps?—could end up being trade bait. 4) Arian Foster has some tread left on the tires. The 29-year-old running back was released by the Texans after rupturing his Achilles last season, but he has a good chance of being Miami’s lead back. The Dolphins plan on running a lot of no-huddle and not subbing personnel groups during a drive, and the simple answer is that Foster is the most complete back on the roster and has the best chance of seeing the field the most. 5) It was neat to see Bryan Thomas, who had an 11-year career as a Jets outside linebacker, in Davie as a training camp scouting intern. Mike Tannenbaum, now Miami’s EVP of football operations, was the Jets GM during most of Thomas’ career there and gave Thomas a chance to dip his toe in the scouting world. Scouting hasn’t traditionally been a popular post-career path for players, but more and more longtime players, like Philly’s Brian Dawkins, are giving it a try. The scouting grind is a lot to take on after a long playing career, but players also have a unique eye for what to look for in talent.